We have Just Sold out of Batman Begins 1/4th Scale Action Figure. Not to Worry! Fill in the Notify me When Available and you will be the first in line for our restock of Batman Begins 1/4th Scale Action Figure !! From the Batman Begins collection by NECA. Batman Begins 1/4th Scale Action Figure. 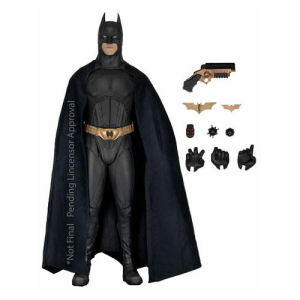 Batman stands over 18 inches tall and comes with a soft fabric cape. Action figure includes grapnel gun - large hinged Batarang - small Batarang - open and closed mines - sonar communicator - two pairs of hands. NECA Batman Action Figures shipping from Canada. No Surprise Border fees or Customs!